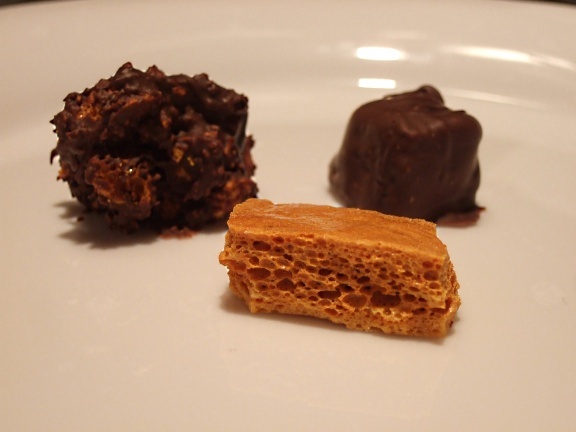 From left to right: honeycomb clusters, plain honeycomb candy, chocolate-covered honeycomb candy. Taste & Create is a wonderful event where food bloggers are paired up and asked to choose a recipe from their partner’s blog, cook/bake it up, and post the results. My partner was KJ of A Cracking Good Egg and, when I realized what had happened, I began rifling through her posts like my life depended on it. Before I continue, let me apologize: KJ, I am so sorry I am late with this post. You and your lovely blog do not deserve it! I’m also sorry that I’m late submitting to Taste & Create – so, so sorry! After taking a good long look at A Cracking Good Egg, I realized making a choice would be difficult; KJ has so many delicious recipes! But in the end, my sweet tooth won out and went with her recipe for honeycomb candy. It looks a lot like a regional Rochester favorite, sponge candy, and I’d never made so I thought I’d give it a go. Who knew something so simple could yeild such complex flavors and textures? The carmelized sugar gets a sharp tang (it’s hard for me to describe) from the addition of baking soda, so the final flavor it a bit like a toasted marsmallow with a bite. The texture, of course, is NOTHING like a marshmallow, again thanks to the baking soda. When it cools, you get a crunchy, bubbly confection. I covered mine in semi-sweet chocolate which was very nice, though I think I would have preferred a milk chocolate to off set a bit of the candy’s bite. So please head over to A Cracking Good Egg to get the recipe for honeycomb candy and take a look at all of KJ’s wonderful recipes. And again, my apologies for being late!